Pioneers in the industry, we offer viton diaphragms from India. We specialize in manufacturing rubber Viton Diaphragms for the Gas industry. We have supplied more than 15,00,000 sets to Kosan. We manufacture high-quality diaphragms that are used in various industrial applications as an isolator of different enclosures. Usually, these diaphragms are used in pumps, valves, regulators, accumulators, actuators etc. Our wide range of diaphragms is fabricated using superior quality materials so that they effectively work in different working environments. 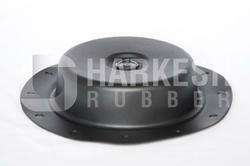 Diaphragms are usual fabric reinforced and used with air or fluid media. Diaphragms are widely used in industries like chemical, food processing, pharmaceutical, beverages, etc. The main function of the diaphragms is used to protect the process fluids from the pressure sensor. We have also developed special thin wall diaphragms for actuator applications. This level of accuracy is something which very few can deliver in the industry. Our products effectively work in any working condition and applicable in industrial and common uses. Looking for Viton Diaphragms ?